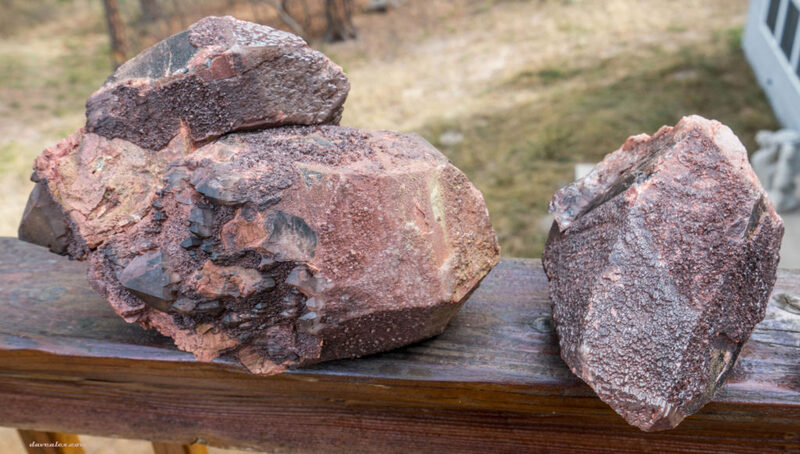 This summer was great, but different than previous, for picking and rockhounding. My club field trip availability was limited–I led two trips and was able to make only one other. 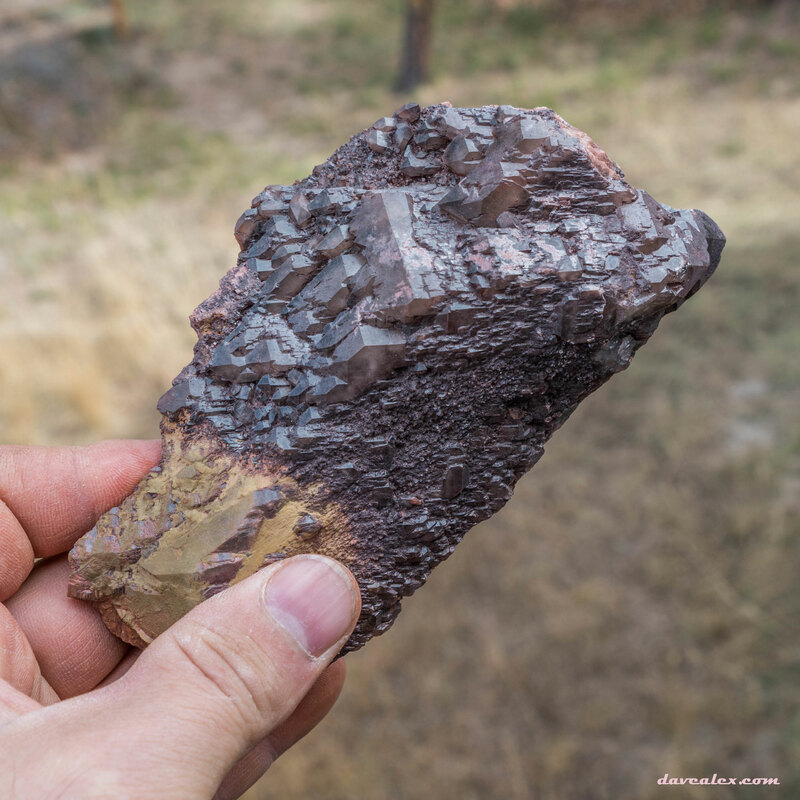 I went to Gem-o-rama in California with a rockhound buddy (see other blog post for that adventure). The remainder of my rockhounding trips this summer revolved around a pocket I uncovered during one of the club field trips I went on. I didn’t get out nearly as many times as I have in previous years; but the times I did get out were all high quality, extremely fun and productive! 2016 I would say it was a very successful season! NOTE: As always, click on the pictures for a HD version. Trust me, it’s worth it! The videos are all available in HD as well. On my third club field trip of the year I hit into a pocket that consumed 5 days of hard and thrilling work in the following month. 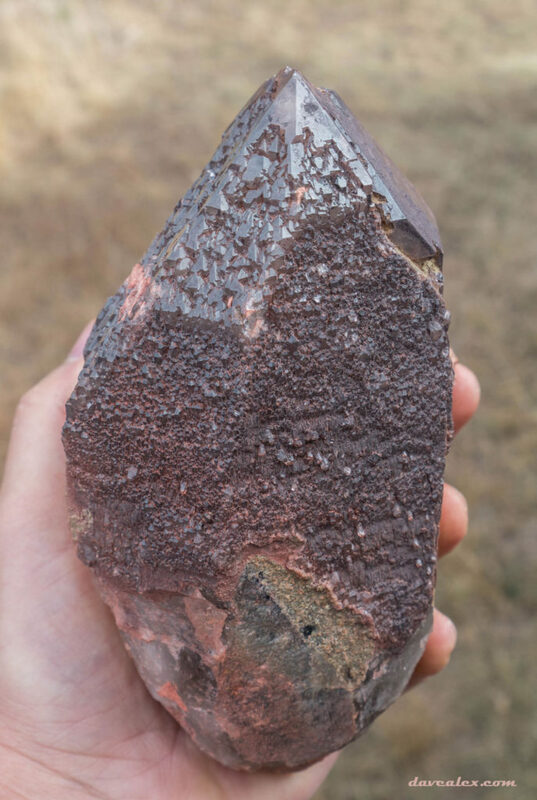 It was the biggest crystal pocket I’ve ever found and had some really interesting and amazing crystals. 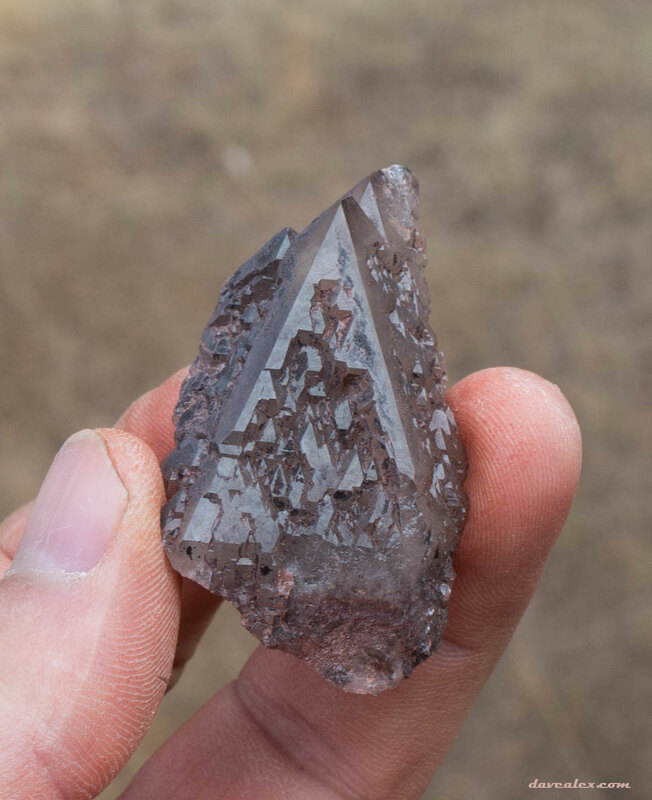 It took me until the very last day of digging to think of the proper name for this pocket…over the month I continually thought about the pocket and realized I had a crush on it…and most of the crystals were damaged due to ancient violence, so I figured the name “Crush” described the experience perfectly! 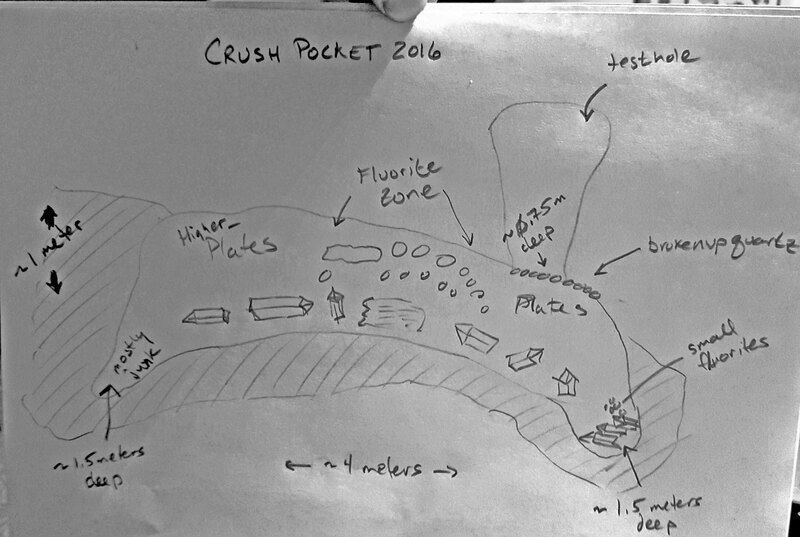 Here is a _very_ rough drawing of the pocket. Note I have little artistic skills, lol! You can see where I entered in the upper right. The crystal pocket measured about 4 meters long, 0.6 meter diameter and the bottom was 1.5 meters underground. It all started with a test hole about a meter from the pocket. From others’ experience in this area I knew that crystal pockets tended to be rather deep, so all my test holes need to go at least 1/2 meter deep. 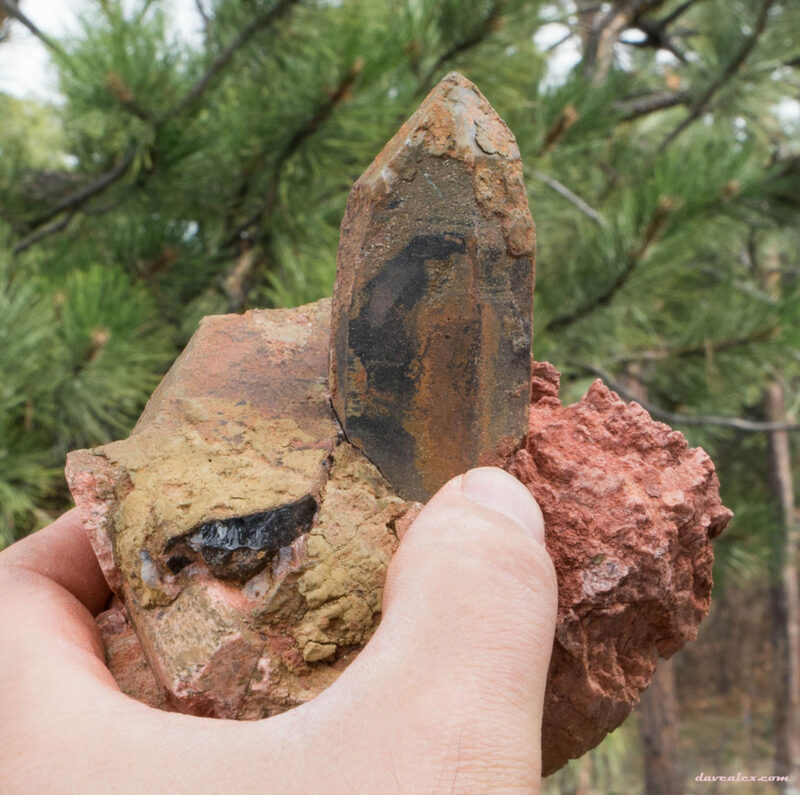 When the hole was about a meter diameter, I started to see a shift in color of the soil to a darker brown so I followed it–it was a subtle sign, but something “different” is often what leads you on the crystal trail! Not too much further I started to get into small chips of quartz which quickly turned into a layer of small quartz chips. These chips had no faces or flat sides. Breaking through that layer I entered a zone of darker material and started finding crystal faces. I was in the top of the pocket! 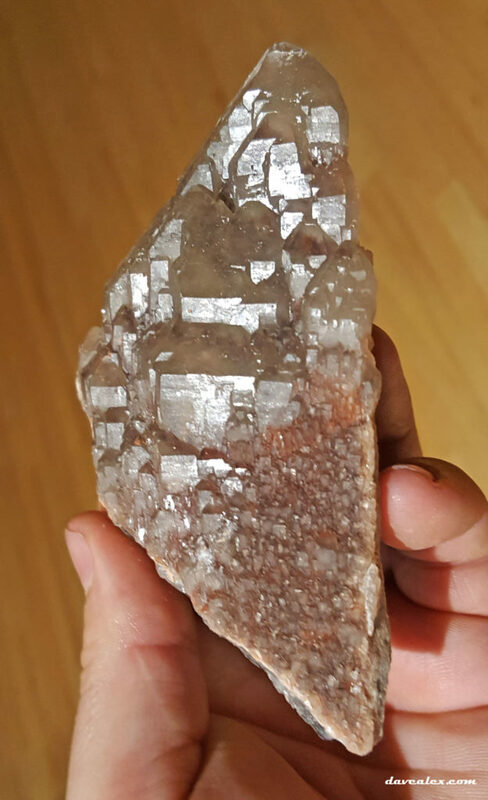 The first crystal plate/cluster I pulled out of the top of the pocket. I’d say that is a good sign of things to come! 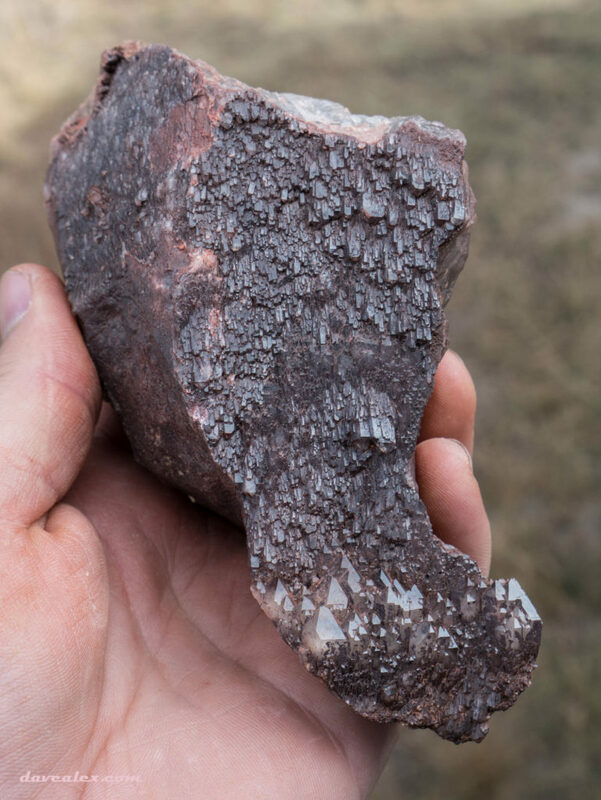 This whole top and side of the pocket (along most of its length, except the ends) was softer clevlandite/feldspar material with large chunks of quartz buried here and there within; these quartz plates had beautiful secondary growth clear quartz all over one side, but in this layer nothing was fully euhedral. This layer of the pocket was about 10-25 centimeters thick and produced some nice plates of parallel growth clear quartz. I continued to follow this trend horizontally (to bottom and right in the above diagram) until I reached the end of the pocket material — I was back into normal top soil-dirt and gravel underneath. 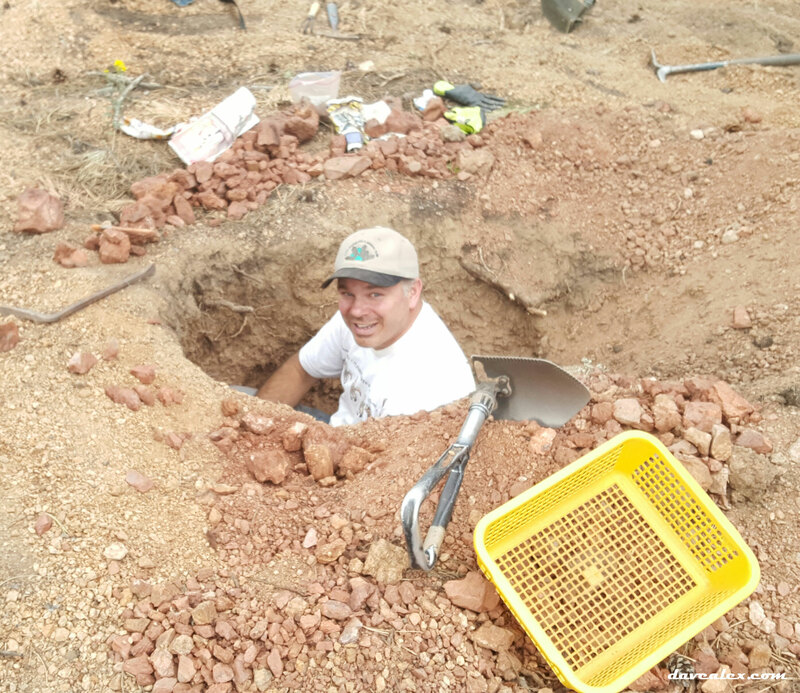 That is when I started to excavate straight down. It was just a few minutes and then I hit extremely red pocket dirt/mud material which is the tell-tale sign of a crystal pocket! For the rest of the day I continued to pull out more of the same type of secondary growth plates and individual crystals with secondary overgrowth. 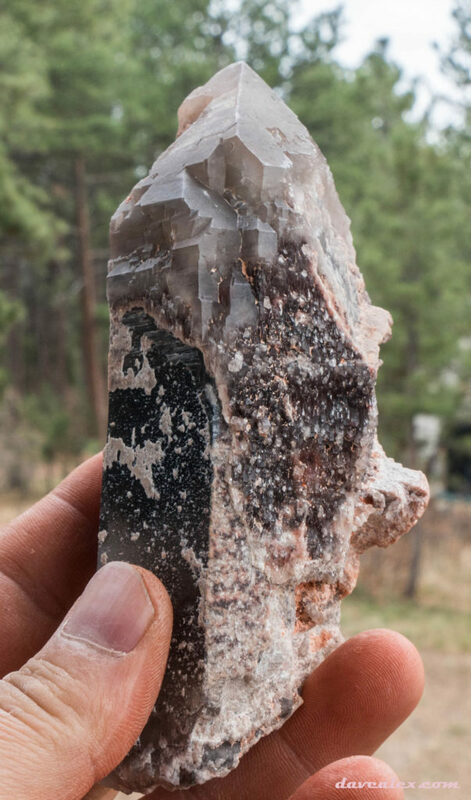 Some really neat and unique crystals! This was the largest plate I pulled out on the first day. 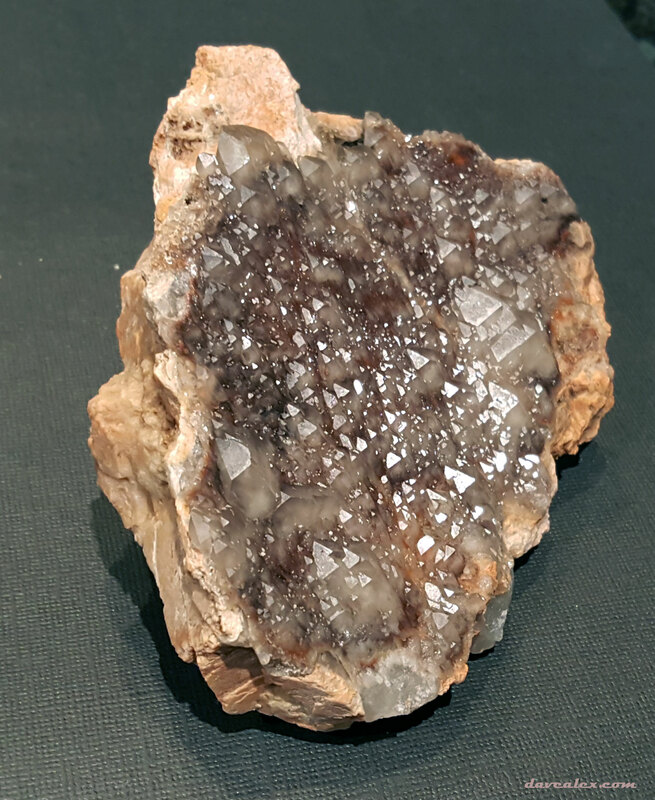 The flow of the crystals is evident, this is about 30 cm wide. Note that the crystals change direction in the middle of the plate so they are pointing toward each other. I’m sure there is a reason for this, hit me up in the comments if you know why that would be! You’ll want to click on this image for a close up! This is a really interesting crystal, I love the large terminated crystal surrounded with the smaller parallel growth, and then the different type of cluster growth at the bottom, first small then larger–all of this on the same plate! Also, the crystals at the very top are pointing down and immediately they reverse. 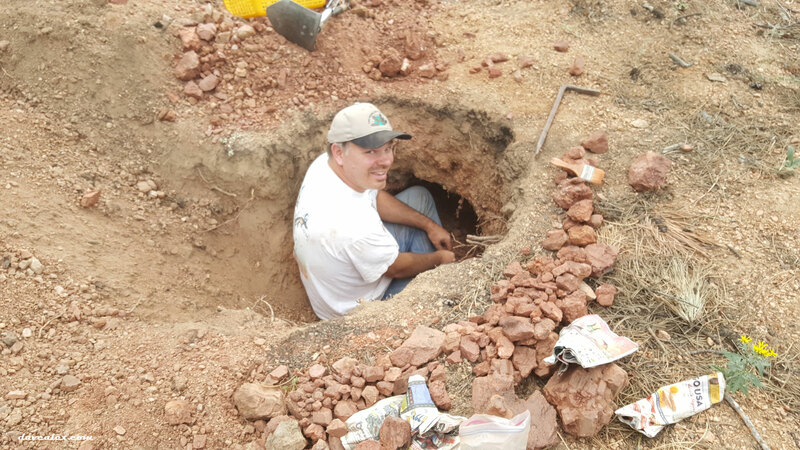 Thanks to Matt who was also on the field trip for taking this shot; I was back filling the hole as I progressed down. I was still only about 1/2 way through the depth of the pocket here. What an awesome day! Given the pocket was trending downwards, my plan for the second day was to remove the overburden over the deepest part of the hole and also widen the hole so I could continue picking crystals starting with a large crystal I already partially uncovered. Its good to have a plan, but its also good to be flexible! As I was mucking, I noticed that there was more of the pocket heading the other way (i.e. in the direction of the picture taker in the above shot). I ended up focusing on that direction for the entire day as the pocket continued, and got better (!! ), in the opposite direction than I originally planned! 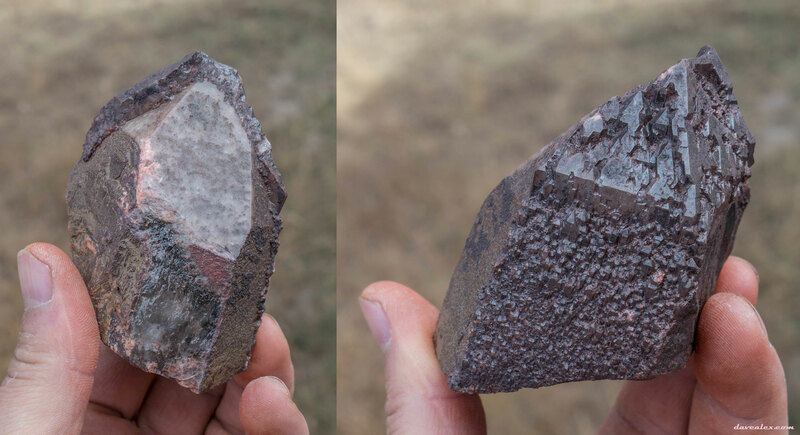 The pocket continued as described with the crystal plates at the top and side; but as I progressed I noticed that the floor of the pocket had a layer of larger more well formed crystals and finally microcline at the bottom before it ended up gravel. So I was now seeing the entire dimension of the pocket, about 2/3 meter tall and 1/2 meter wide. 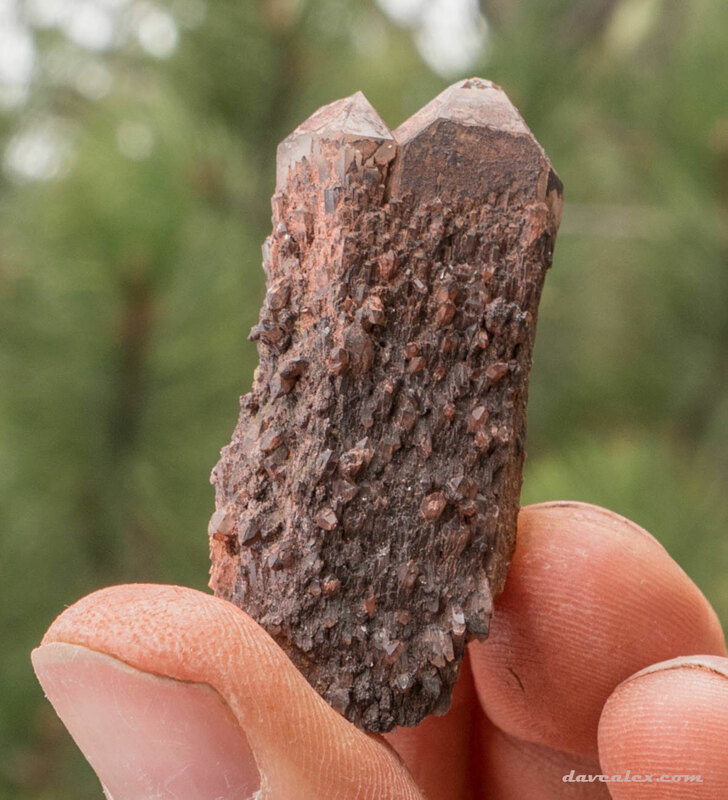 An hour or so later, in the center of the pocket, the red mud/clay turned to purple in a couple of spots; that is when I started to find some small fluorite crystals. 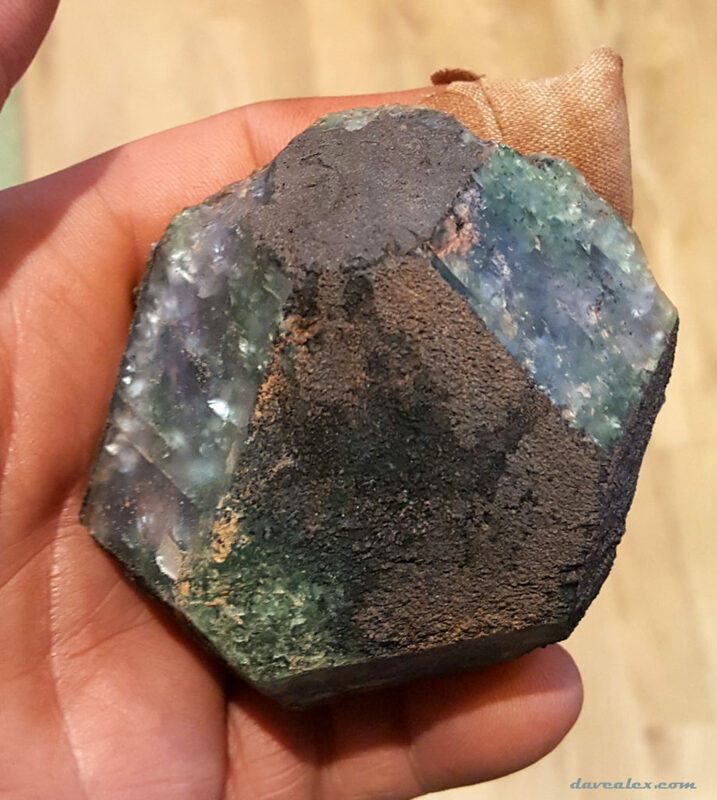 These fluorites were a truncated octahedron shape, kinda like a soccer ball. They started out really small (~1 cm) in single crystals but then out came out in small plates. 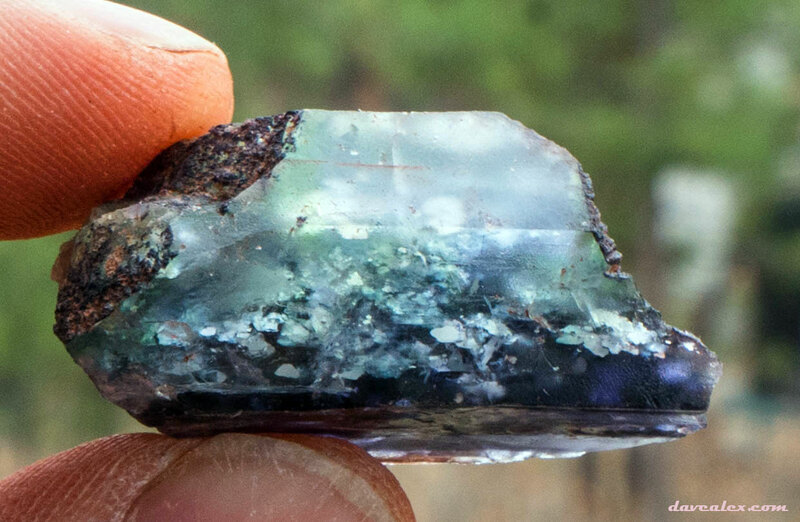 A 1/4 meter further, along the side wall of the pocket, the fluorites started to get rather large, up to 8 cm. 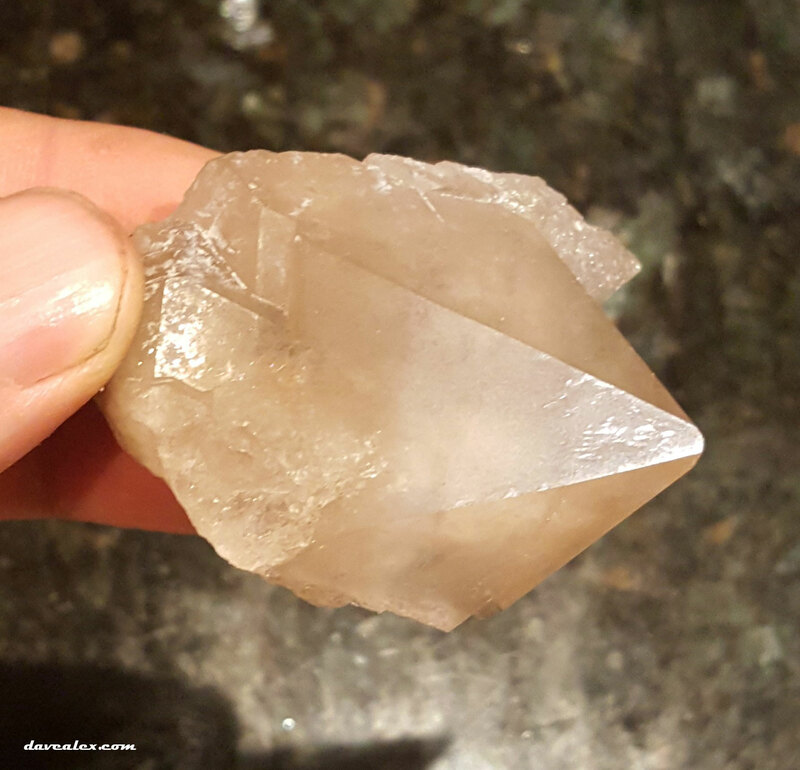 At the same time the bottom of the pocket had a couple of large quartz crystals. 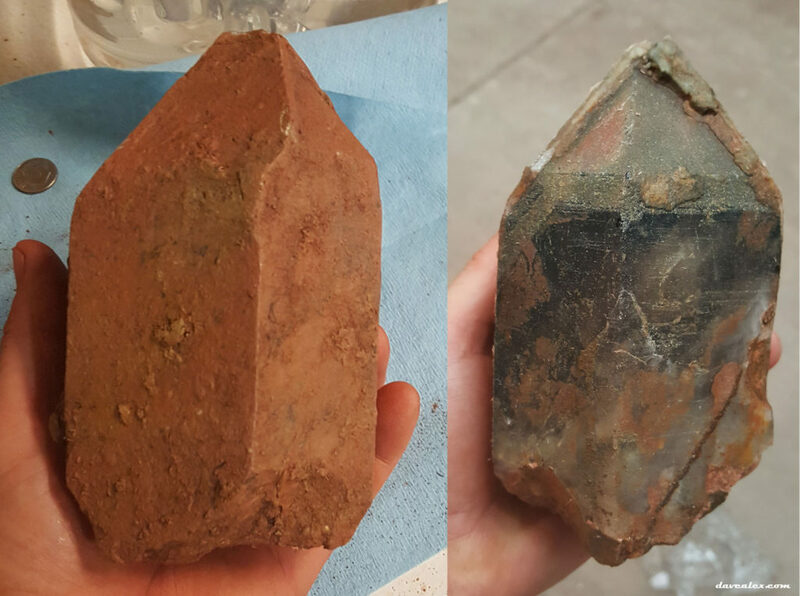 This is one of the larger fluorite crystals I pulled out, definitely the largest on the second day. Note that the square sides do not have any coatings; but the other sides have a purple coating. Really interesting! This is an example of a truncated octahedron. 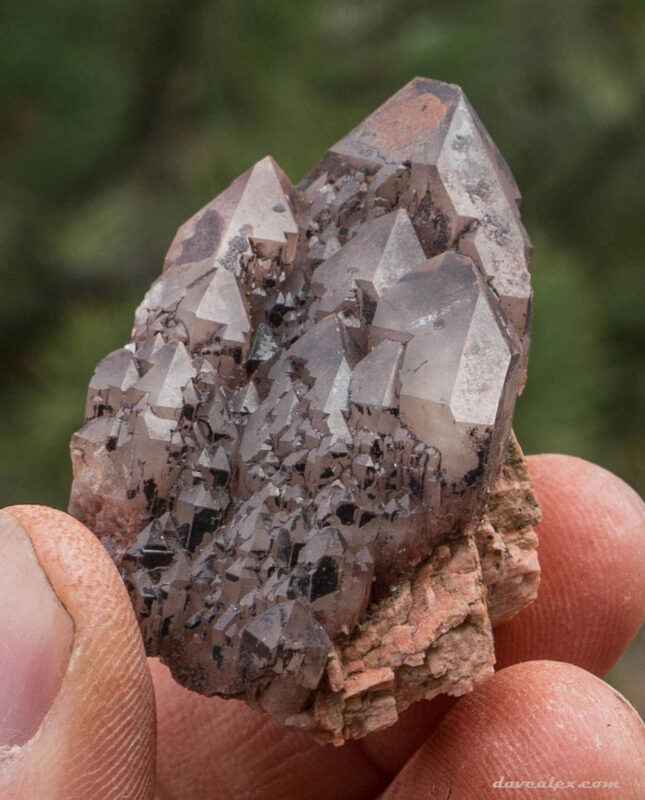 The fluorite crystals I found were very close to this, however only a few of the smaller ones were completely euhedral. The larger ones were about 1/2 of what is shown here. 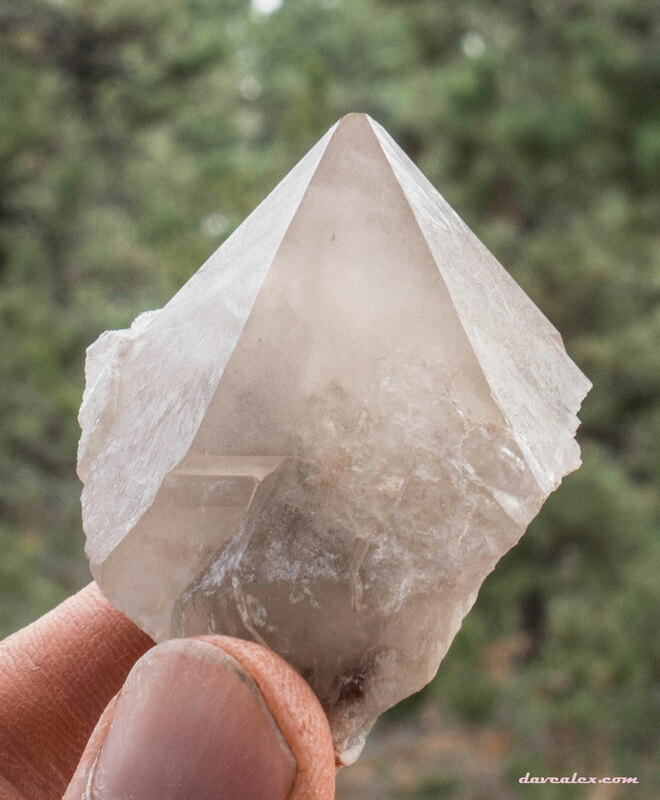 This is the large quartz that was sitting on the bottom of the pocket. 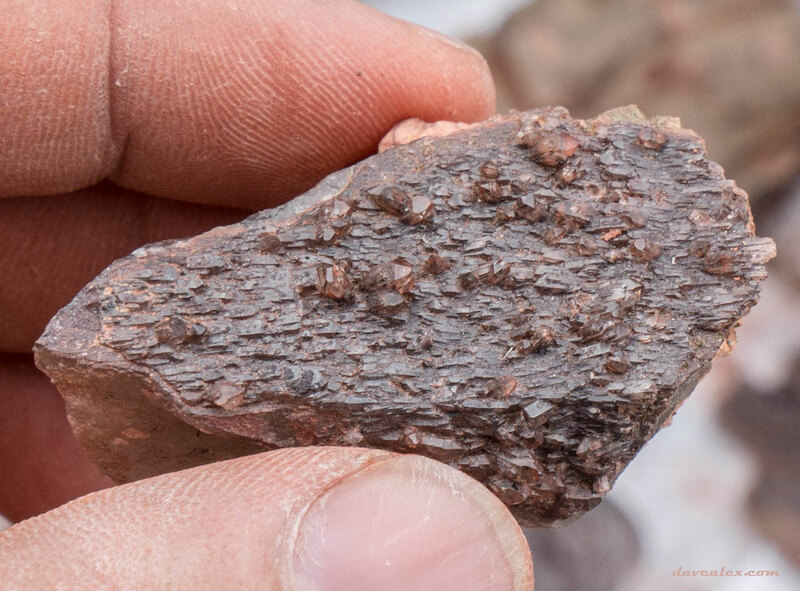 Three of the sides were covered in the secondary growth terminating with larger crystals at the top. 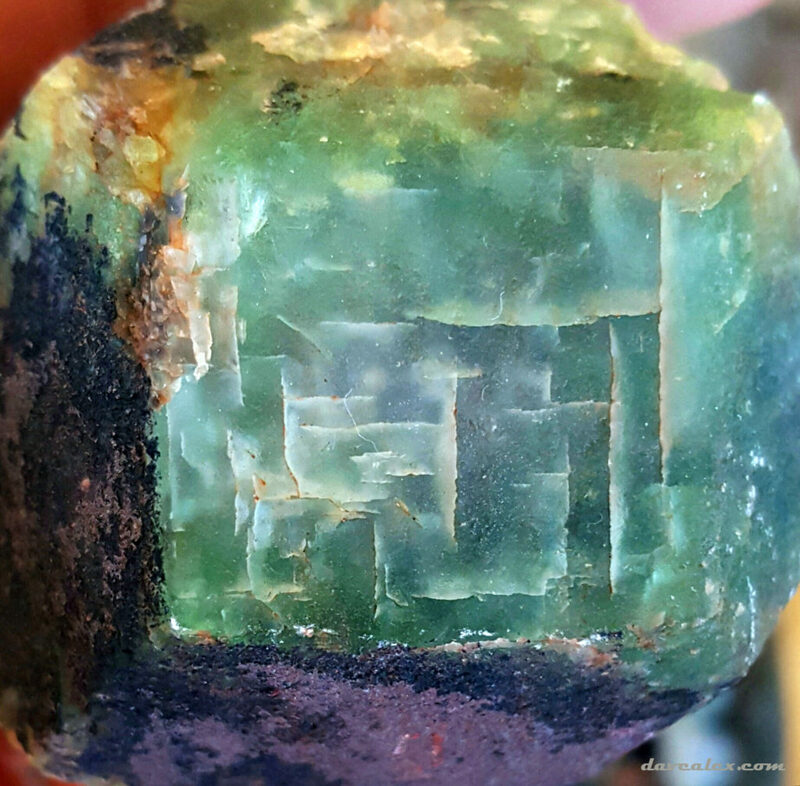 It had a small cluster of fluorite on the right side, which was the direction where I was pulling out the fluorite mini-soccer balls. This was the largest crystal that came out of the pocket although it wasn’t euhedral! The pocket didn’t show any signs of stopping, and all of a sudden it was dark. The nearly full moon was illuminating the ground through the trees. I was exhausted but needed to fill in the hole. So I started that tedious process and a little while later realized I was surrounded by coyotes…they must have killed something because they were screeching and barking in all directions! The whole experience made me think Edgar Allen Poe…the evening ended with the soundtrack of me filling in a large hole by the moonlight…what is going on in them woods after dark? So as many of you that pick crystals know; when your into the crystals and have to leave a pocket, you continuously think about the pocket while waiting for your next trip! I’m no different and since I knew it was going to be a week before I could head back up, I couldn’t help but go through the fantasy scenarios and put together a plan of attack for that next trip. 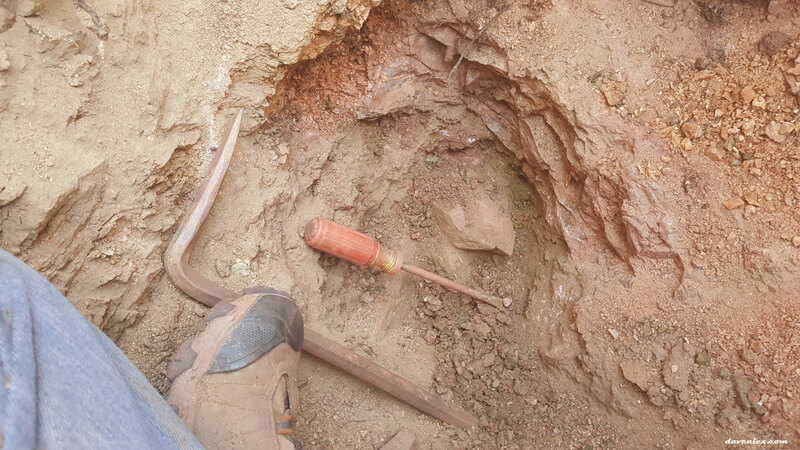 My plan was to excavate the far end of the pocket I was in day 1, taking out the overburden, widening the hole and pulling out the large crystal that was “stuck” and generally seeing how long that side of the pocket continued. Then, if I extinguished that side of the pocket, I would dig a new hole on the left side (again see diagram above) and meet up with where I left off after day 2. This would be less work by minimizing the mucking and centering the next portal along a new section of the pocket! I had my plan and was able to take a day off of work a little over a week later. 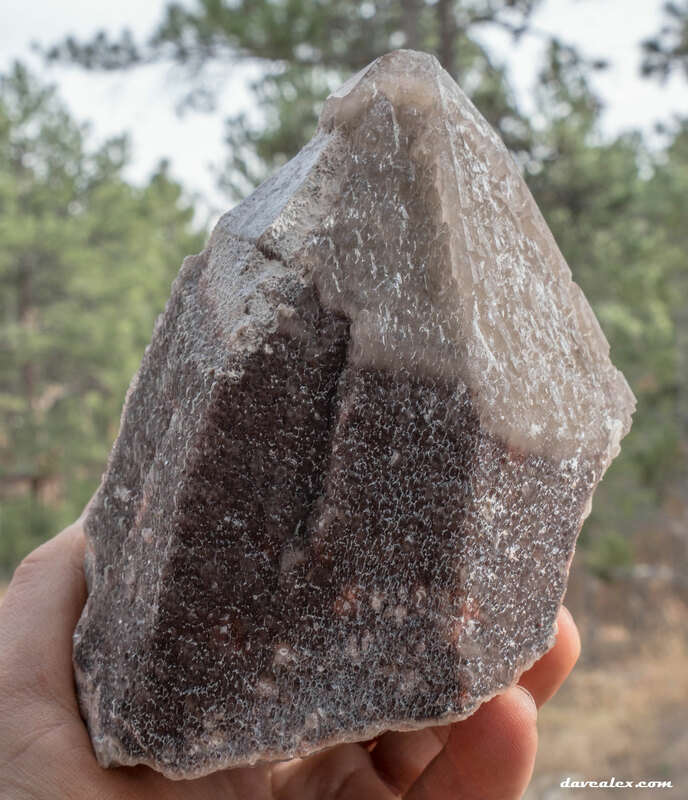 I decided I’d head up after work and set up camp, do the mucking of the hole and then go to sleep; waking up at the crack of dawn and start plucking crystals on my day off. Ended up getting a later start then I planned and it was dark by the time I arrived. I lit the lantern, set up camp, and then started the mucking which took a while. Of course, my plan was flawed because there is no way I can expose a crystal and not try to remove it! So I ended up working on the pocket until 2 am when my headlamp batteries started to dim! I then watched a meteorite shower and hit the sack. The next morning I went down and continued with that side of the pocket until it pinched out. 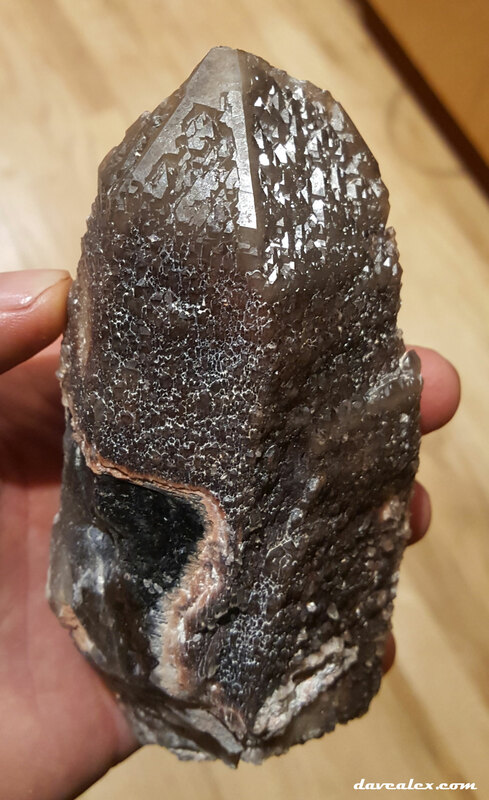 I was able to remove several large crystals (seen in the video) and behind these crystals the pocket pinched out. I hit nothing for the next 1/2 meter so I felt I reached that end of the pocket. After taking a break I started with phase two of my plan. I hit the end of my day 2 digs a couple of hours later and was back into the crystals. Once back into the pocket I was able to pull out a large chunk of fluorite along the side of the pocket (top side in the diagram). The fluorite came out in many pieces (totaling ~30 cm long, 5 cm tall and 5 cm wide). 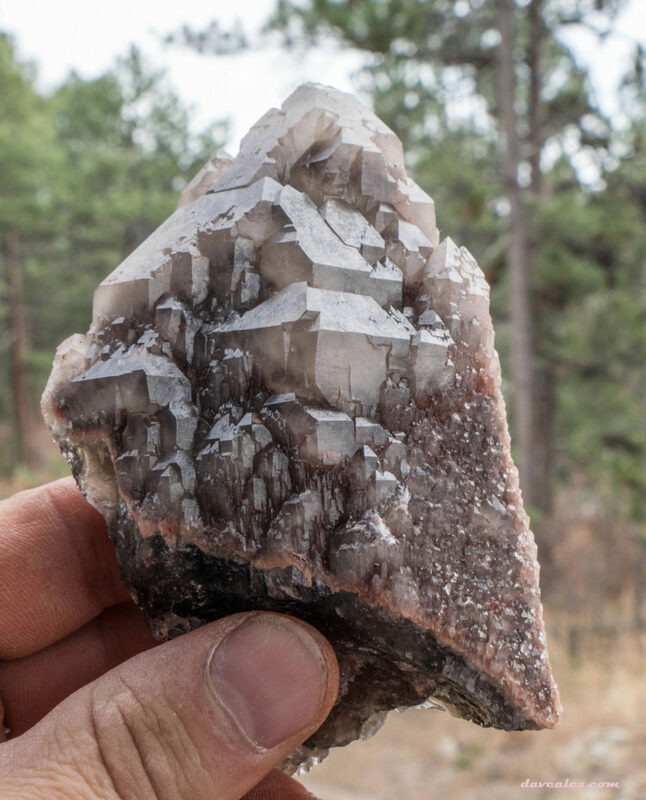 This was exciting because the fluorites were continuing to getting bigger the more I went in this direction! However, that was the last fluorite I found in the pocket. This large chunk was EXTREMELY brittle and broken up and much of it ended up disintegrating when I tried to rinse it off with water. 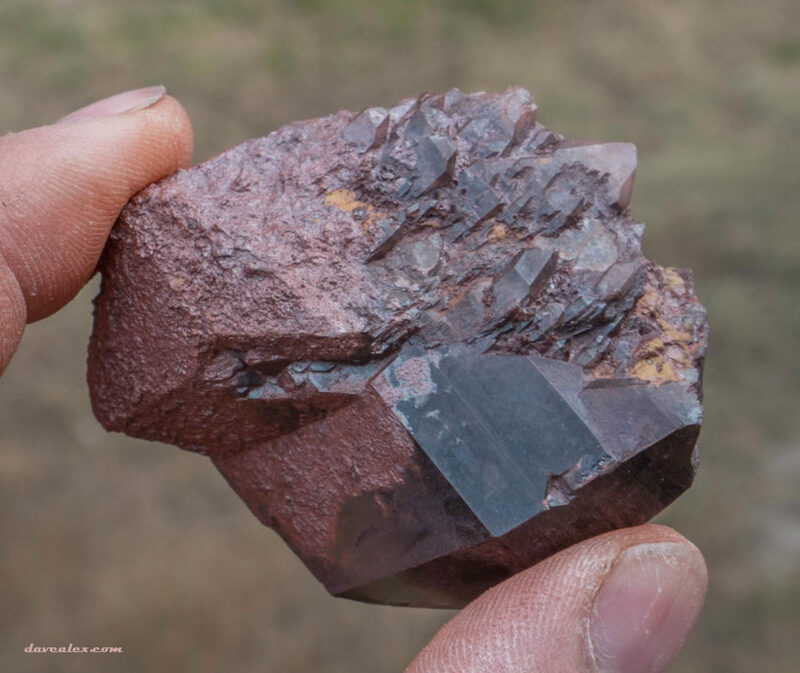 This was part of the large chunk of fluorite–the part that didn’t fully disintegrate when I was washing off the pocket mud! These were some of the large crystals I pulled out right before the pocket pinched out on the right side. 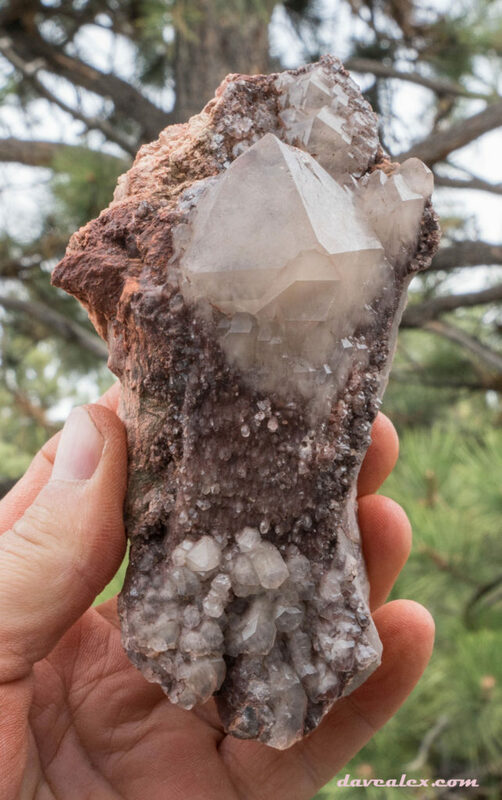 The crystal in the center is about 18 cm in diameter, has a lot of healed terminations, and fits perfectly with the other crystal that was found nearby in the pocket (see video)! 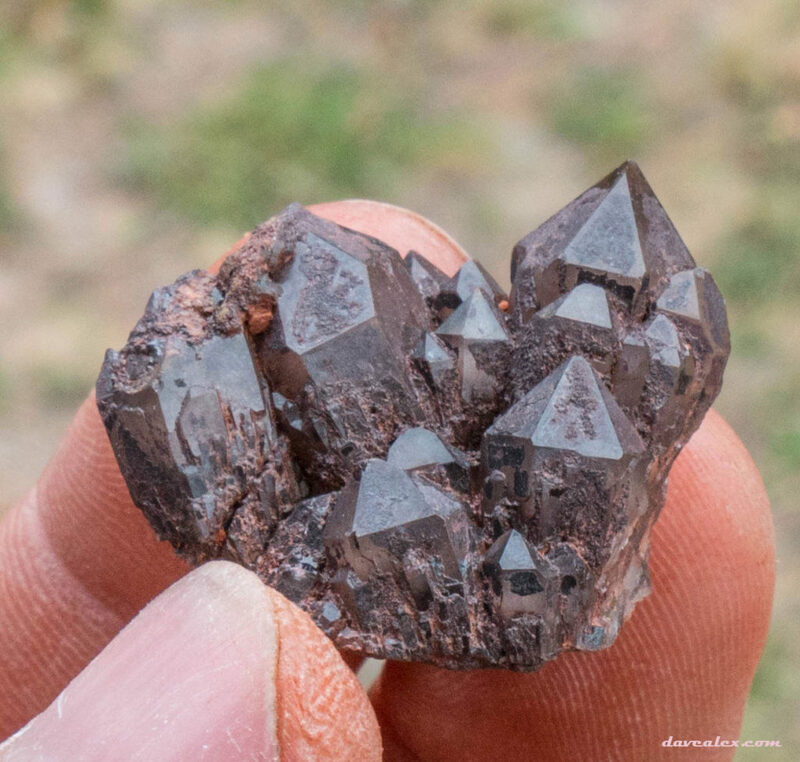 These crystals do have damage–as most crystals did in this pocket (hence the pocket’s name)–but still was a thrill to find! 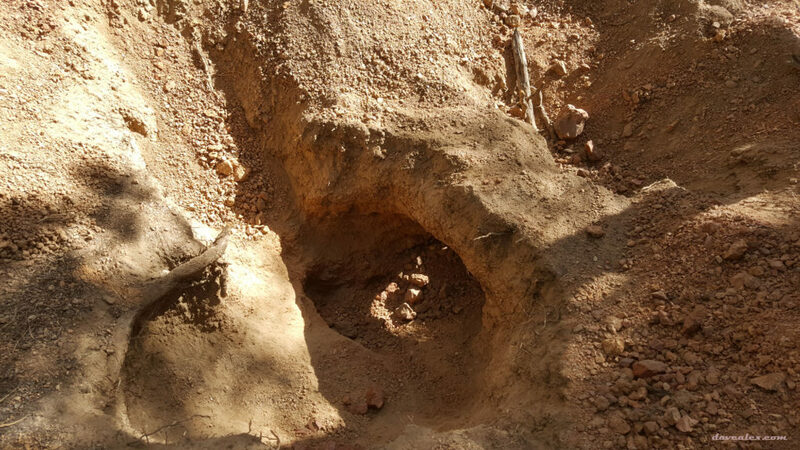 The hole after day 3, again back filling (on the right) to minimize the mucking efforts. 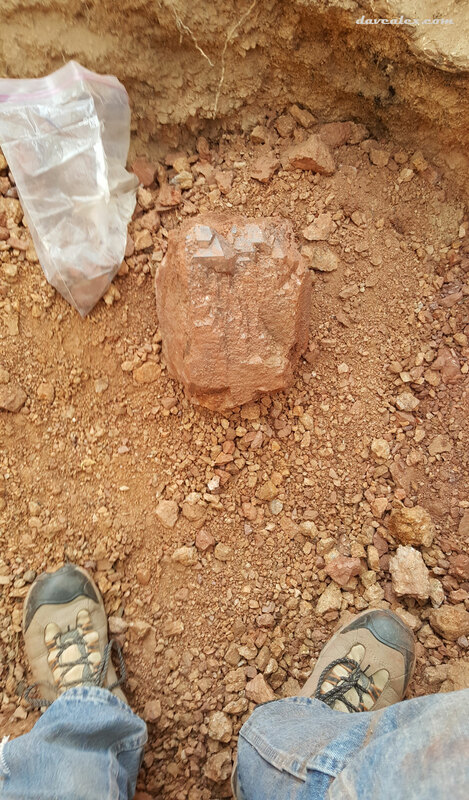 As you can see in the picture, it was awkward and difficult to go to the bottom of the pocket with that overburden there, so on day 4 I removed it. I then spent the remainder of that day taking out the bottom of the pocket and following it further. This section of the pocket started to change from the consistent topography I was getting used to. 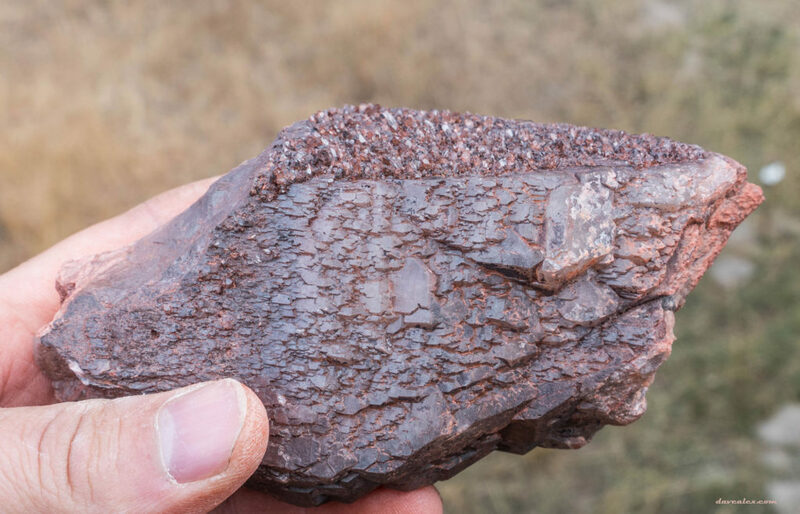 The top of the pocket had less of the softer clevlandite/feldspar than before and was more interlocked quartz and pegmatite. 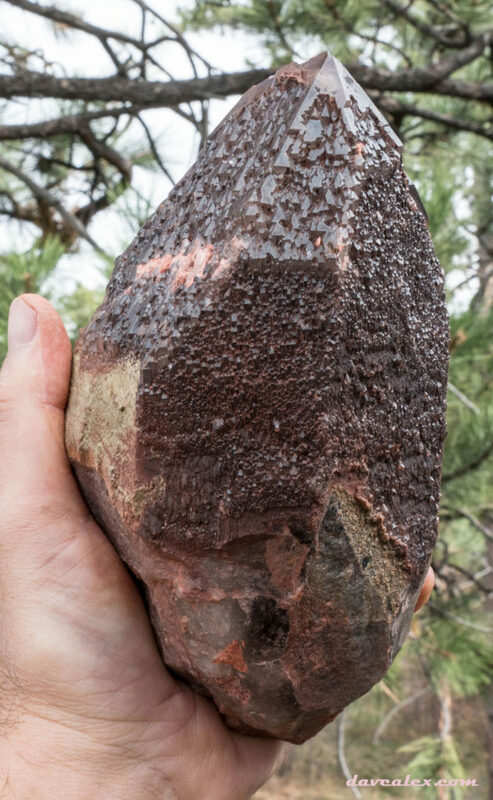 The number of crystals on the top was significantly less than before; the ones that I found were more euhedral and still coated with secondary growth. This side seemed to be where the most violence had occurred because there was a lot of damage to most of the crystals. The clay was also harder and pulling the crystals out without damaging them further made progress considerably slower. There was no more fluorite found on this side of the pocket. After day #4, I added the wooden dam so I didn’t have to worry about the other side of the hole continuously filling in while I was mucking and working the pocket. 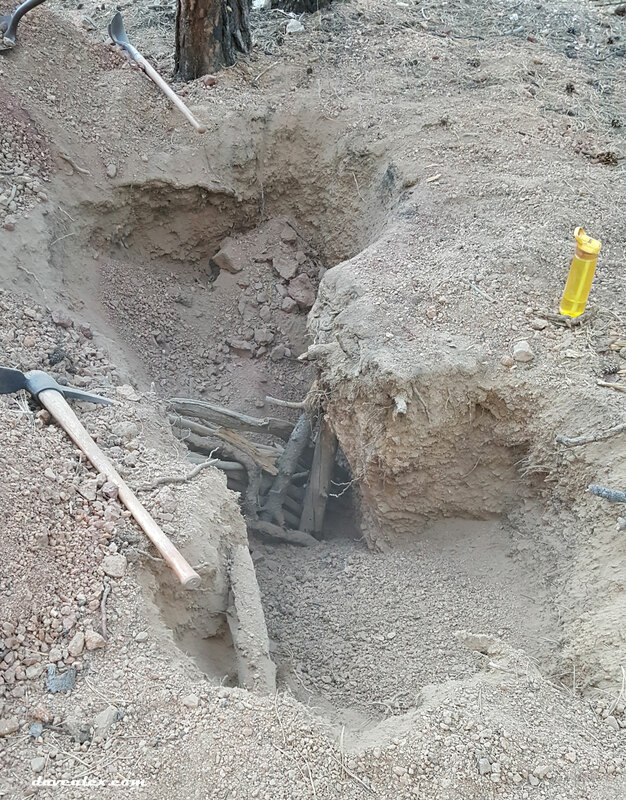 I had started filling the hole before I took this picture, the bottom is another 1/3 meter buried. The fifth day ended up being the final day. 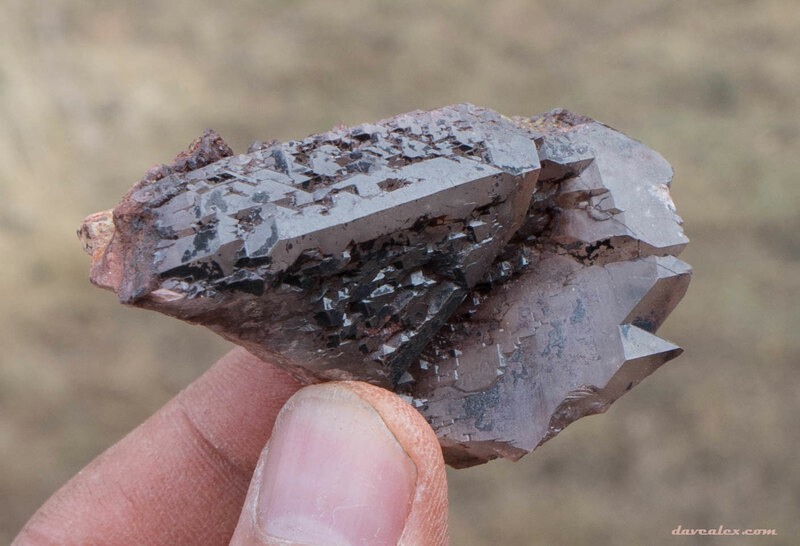 I was able to pull out a couple more really nice crystals as the pocket started to dive under a pegmatite rhine. 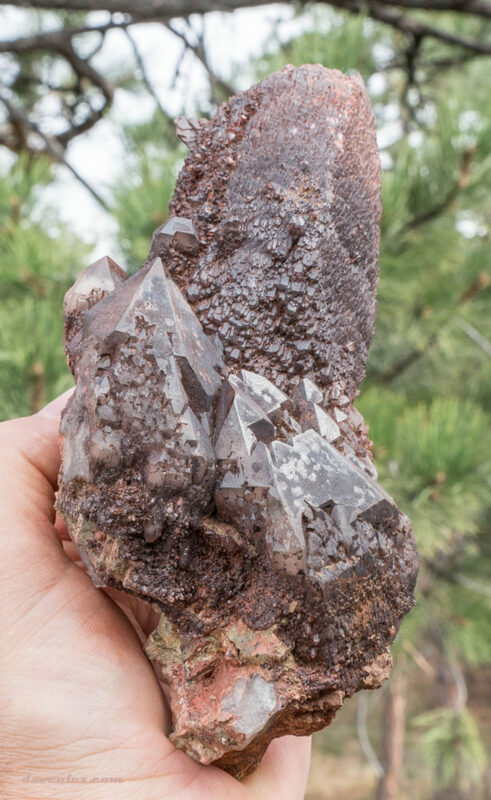 The crystals below this point were no longer coated with secondary growth and all were intergrown and not fully euhedral. 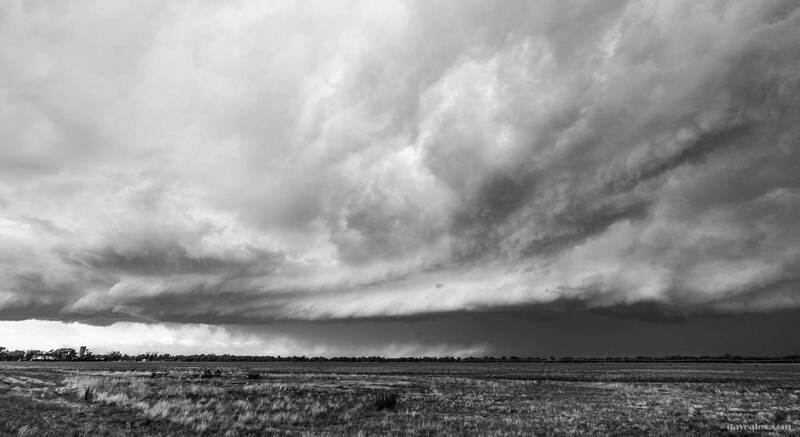 Many were still large. 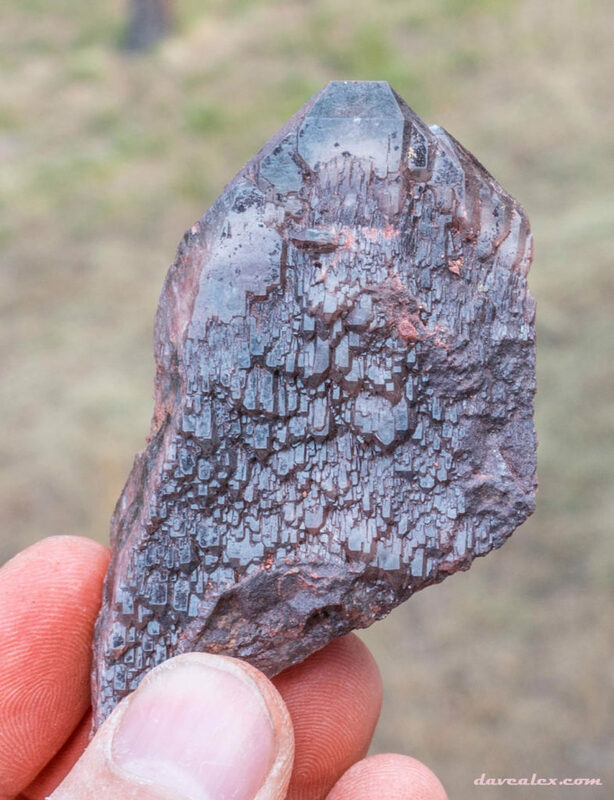 Once the pocket started to dive downward, the sides of the pocket were difficult digging and the crystals weren’t the quality to pursue further. The pocket had finally pinched out! 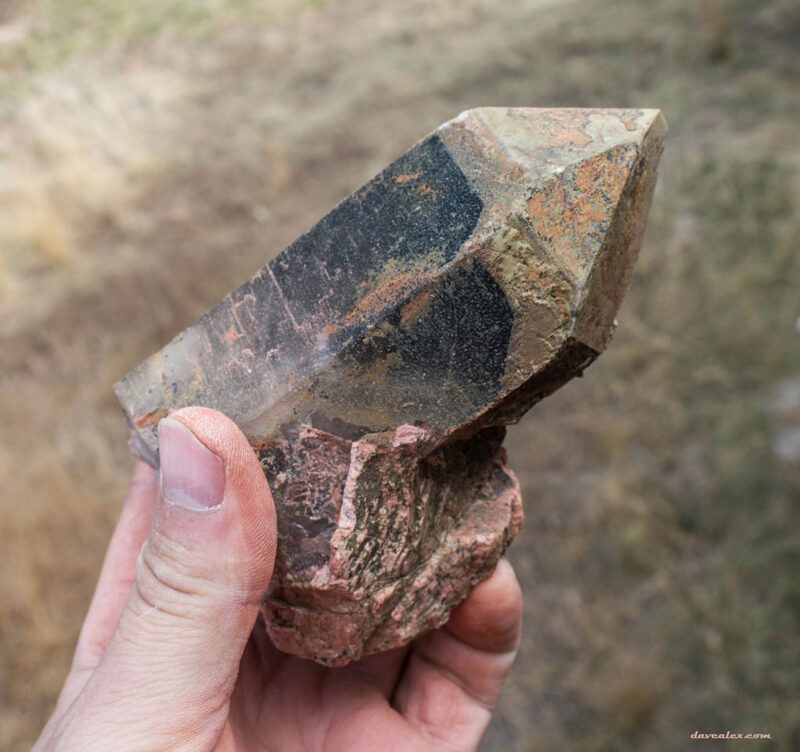 I decided to throw in the towel and celebrate the amazing crystal pocket I had unearthed! 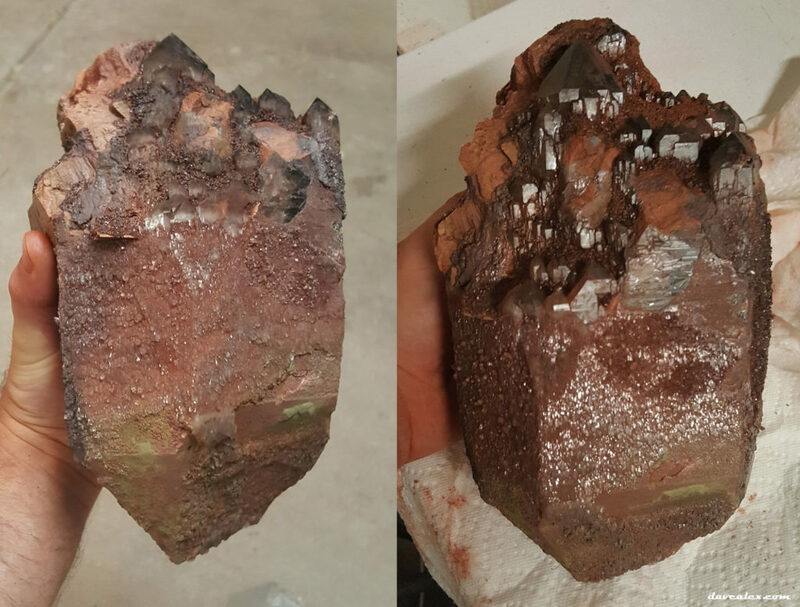 Here are the last crystals I pulled out before it got too uncomfortable to dig and the quality wasn’t worth pursuing any longer. The end of an amazing pocket! Cleaning these crystals has been a chore. They had many phases of growth, first the smoky quartz, then a layer of albite, then a layer of iron oxide, then a layer of clear secondary growth quartz, then another layer of iron oxide and clay. Cleaning these requires a chemical bath and then mechanical cleaning, repeating over and over due to the tremendous amounts of facets that each crystal has. 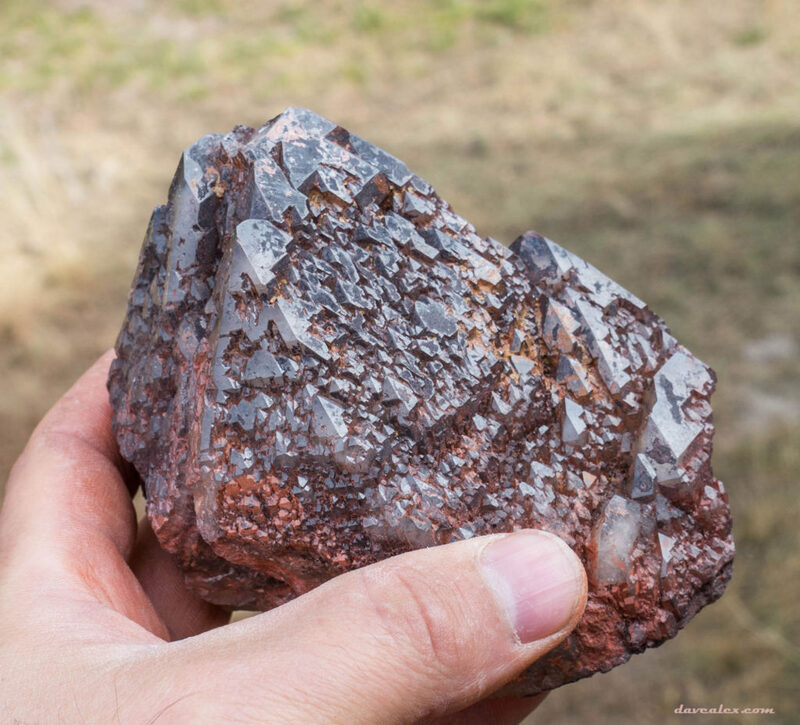 Because there is a layer of iron oxide under the clear quartz, the crystals are somewhat “spotted” with red and white that can’t be removed from under the clear quartz. 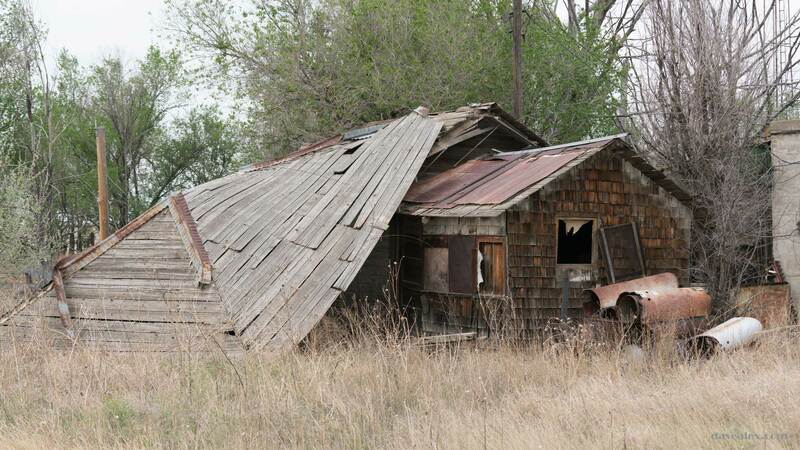 In some instances they beg to be cleaned more, but then you realize that the staining is all under the clear quartz. 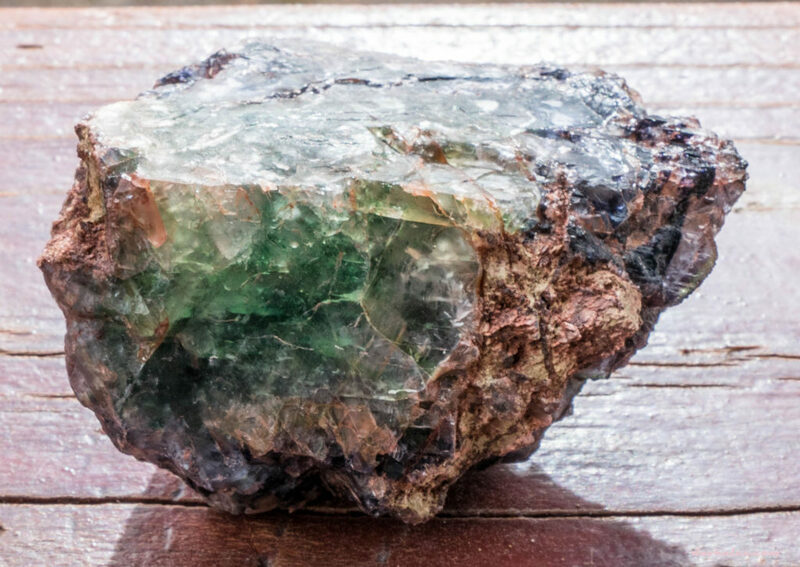 The amount of facets are amazing and each piece, regardless of how little or large–they are all unique! I will probably leave some pieces uncleaned as they will look better that way; while others I’ll spend the winter cleaning. It takes about 2-3 weeks per batch of crystals to get them clean enough for my liking (several iterations of chemical then mechanical cleaning), so it is a slow and labor intensive process. 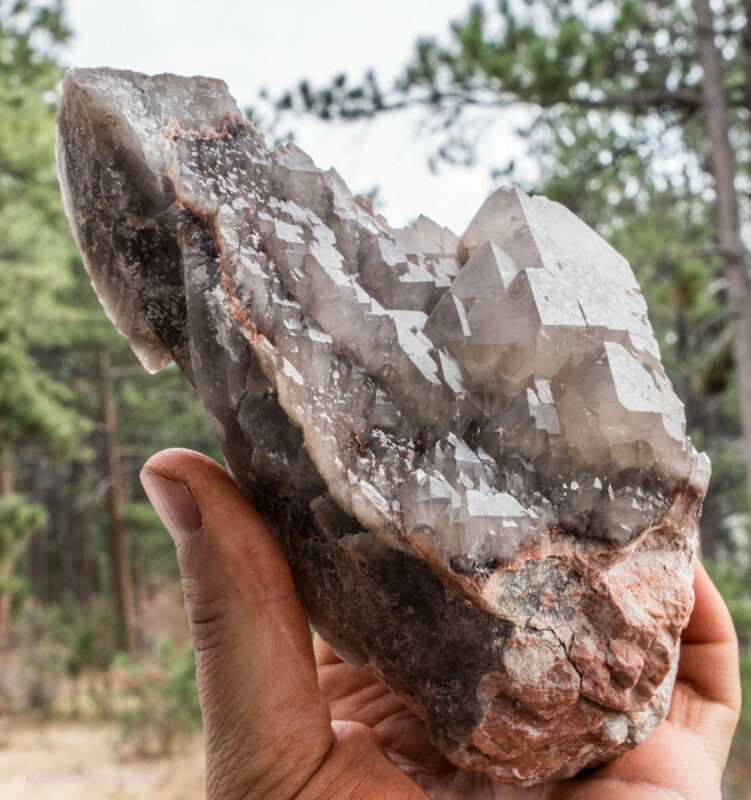 But a day playing with crystals is better than a day at work, that’s for sure! This will add some fun throughout the entire winter! 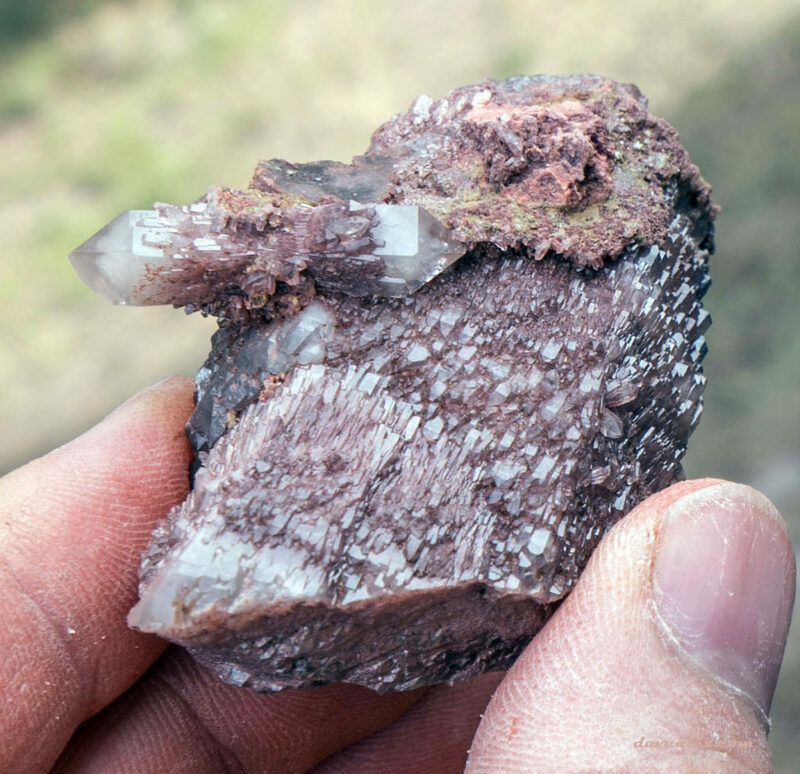 Here is a gallery of some of the crystals and plates that I found. These were some of the large crystals I pulled out right before the pocket pinched out. Well that looks like a summers full of fun!!! Thanks Kevin! I was very fortunate this summer for sure! Soon to post the Gem-o-rama trip which was also spectacular. Been enjoying your blog all summer! Wow what a fabulous pocket you found! It looks like you combined all the suggestions on finding a pocket and a lot of work and came out with some great pieces. I especially like the large fluorite crystal with selectively coated faces. 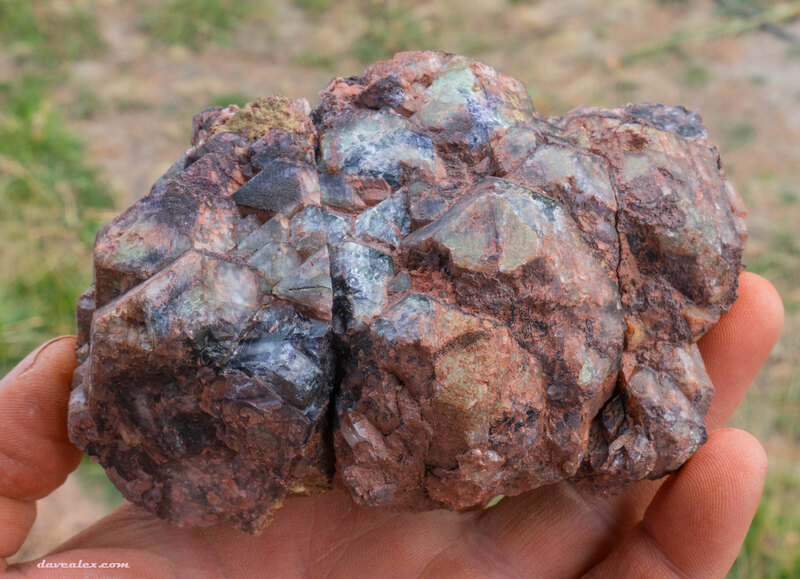 From the pictures it looks like you found both green and purple fluorite. 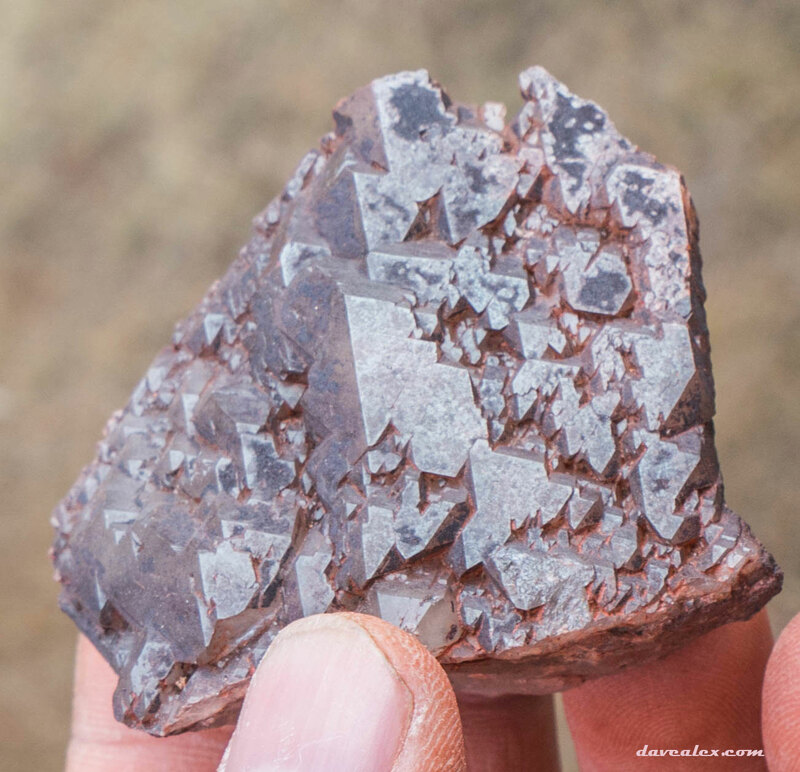 You might want to check some of the rough coated surfaces under a loupe or binocular microscope as you sometimes find neat micro crystals on top. 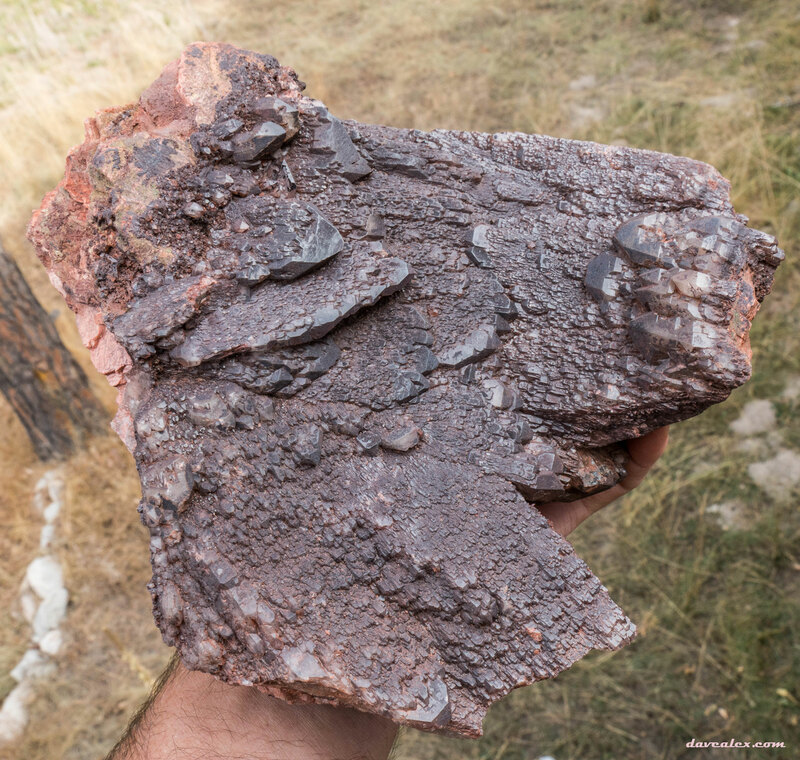 I did go back to my topaz claim to explore the promising spot and did find a small plate of smokies but the granite is very very hard to say the least but there is potential there. I just picked up a 6 foot long scaling bar that my great uncle had used for breaking up rock encountered in digging holes for posts in his job as a lineman for a railroad company. 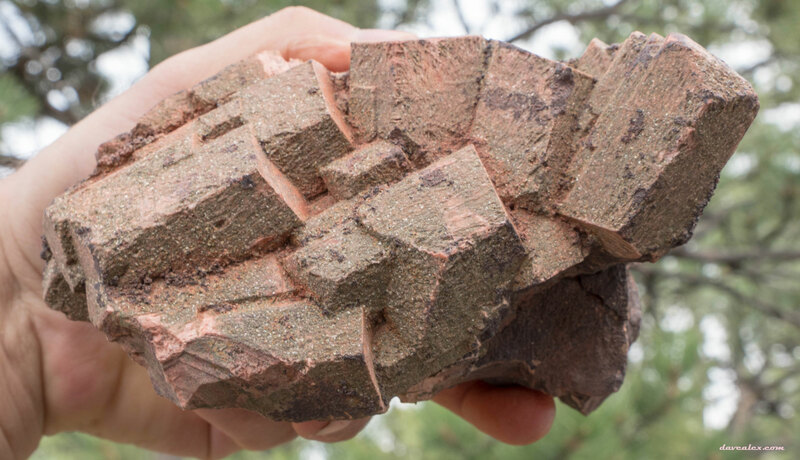 Hopefully it will make it easier to attack the granite. Will send you pics when I have some free time. 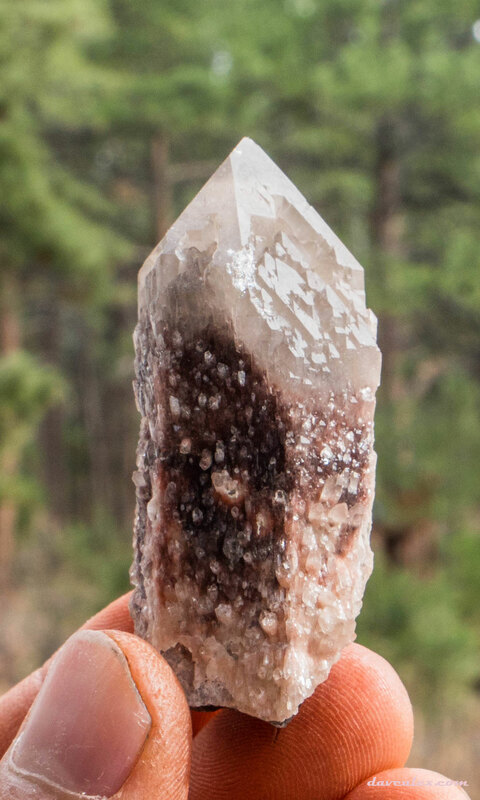 Looking forward to seeing the lake bed digging post as it looks like a fun place for finding cool crystals. Thanks James. No microcrystals on the fluorites, but a lot of microcrystals on some of the quartz! Wow, going hard-rocking at your claim! Those large iron bars can do wonders though! Good luck! …there will be more spectacular pockets in your future, my friend.